Despite September's overabundance of rain, I decided to play FDR Golf Club in South Philadelphia. 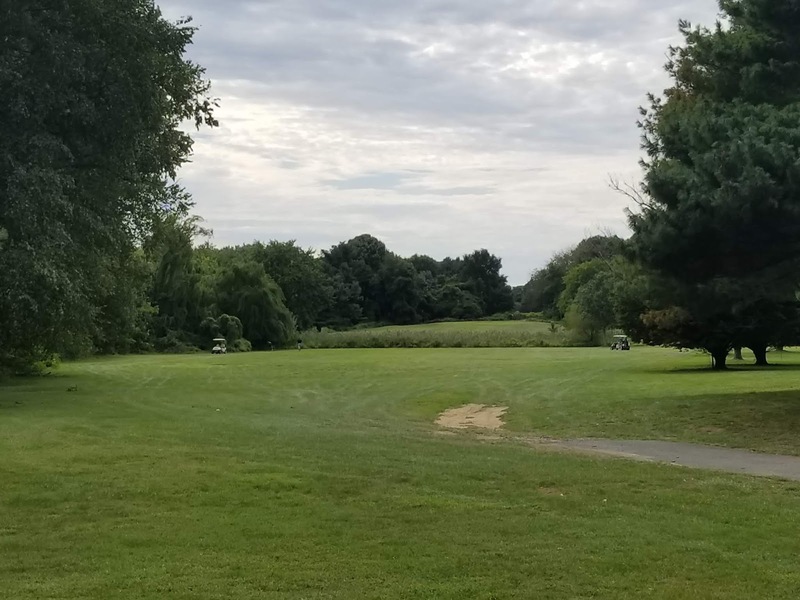 One of the City-owned courses, FDR gets its name from Franklin D. Roosevelt Park, which is known to many native Philadelphians as The Lakes due to the numerous bodies of water found throughout the park. Rain tends to make the course muddy and soft; conditions that linger longer than usual. Teeing it up on the first day of the fall, the temperatures were just a little cooler and the sunny skies gave way to cloudy and windy as the round progressed. Still, I got off to a blazing start as I parred the first two holes. Of course, the Third Hole at FDR is a par 5, and as usual, I struggled to a triple-bogey six. 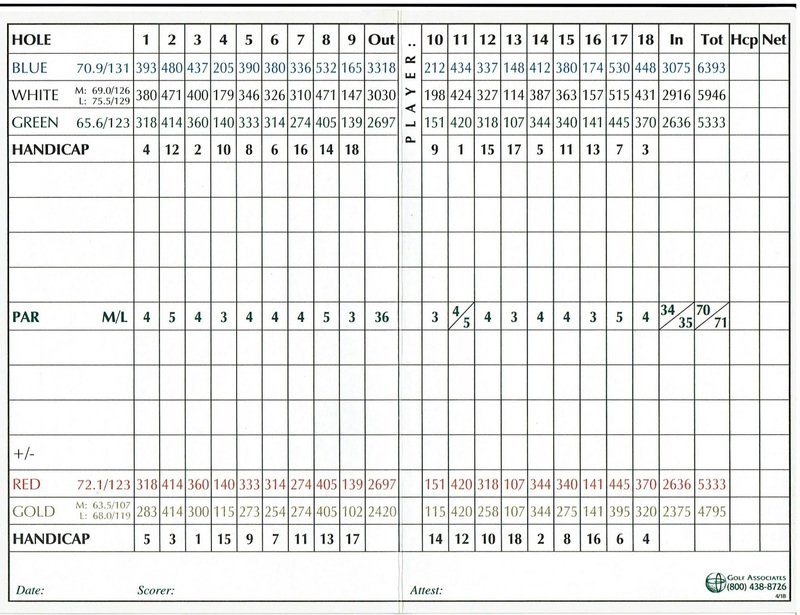 Still, I played consistently through the front nine, parring both par 3s and finishing with a 44 despite a bad double-bogey at the Ninth Hole. As the winds picked up on the back nine, I struggled off the tee, my iron shots weren't solid and my putting erratic. By the Seventeenth Hole I had figured out what I was doing wrong on the greens. I was using a forward press to begin my putting stroke, but that was causing me to miss putts to the left. It is something I need to work on moving forward. I ended up making double-bogey or worse on seven of the nine holes, parring the par 3 Thirteenth and par 4 Eighteenth Hole. I shot a disappointing 51 on the back nine for a round of 95. My third and final round during my week-long Labor Day vacation in Delaware was played at The Rookery North in Milford. Originally built as a private club, Shawnee, in 1957, it was acquired by the owners of The Rookery Golf Club a few years ago and re-branded as The Rookery's north course. I had previously played the course when it was Shawnee nearly 20 years ago, shooting a 99. 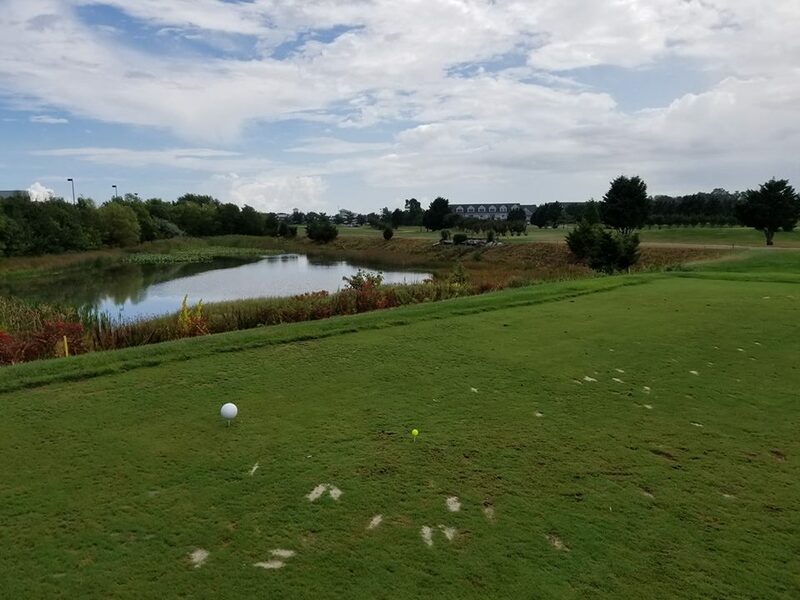 My original intention for my vacation finale was to play at The Rookery's South Course in Milton, Del.,, but an outing had the course closed. So I took a chance and drove to the North Course, about 20 miles north of Lewes, for my round. I felt confident as I teed off, but my opening drive found trees on the left side of the fairway. It was a foreshadow of how my opening nine holes would go as I struggled to find the fairway, and when I did, I could not take advantage. Again, par 5s were a nightmare, as I triple-bogeyed both on the front nine. I made double-bogey or worse on seven of the nine opening holes. It added up to a 55. The back nine was a good bit better. I actually made a birdie at the 114-yard par 3 Thirteenth Hole and parred the long, 198-yard par 3 Tenth Hole. 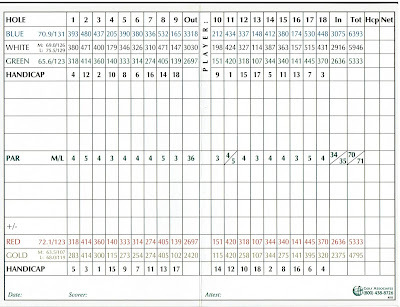 But a quadruple-bogey 8 at the 327-yard Twelfth and a double at par 5 Seventeenth blunted any real momentum, though I did manage a 46 for the nine. That gave me a disappointing 101 for the round. Overall, my three rounds were fun. Except for a three hole stretch at the American Classic I would have shot a fantastic round. And one nine holes--the back at Jonathan's Landing and the front at The Rookery North--kept me from shooting better scores. I was also happy that I got to play two courses that I haven't played in a very long time. 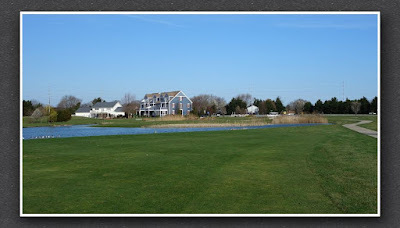 My second round during my Delaware vacation was at Jonathan's Landing Golf Club in Magnolia, Del., just outside Dover, and about 35 miles north of Lewes. I had played the course once 10 years ago and I was looking forward to giving it another try. The two nines at Jonathan's Landing are starkly different. The front nine is more open and is often bounded by marsh areas and wetlands, while the back nine is tighter and winds through a housing development. The two nines have been reversed since the last time I played the course. My round couldn't have gotten off to a worse start: I hit my lay-up second shot at the par 5 First Hole into a marsh area and made double-bogey. 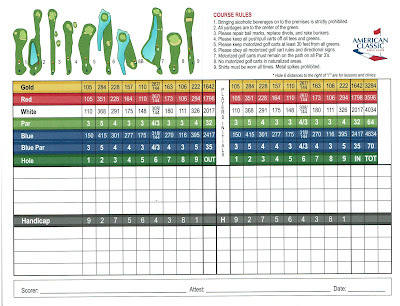 I followed that up with double-bogey's at the par 5 Second and par 4 Third Hole. I righted myself a bit with back-to-back pars at the Fourth and Fifth holes, with another par at the 137-yard par 3 Eighth. I shot a 47 on my opening nine and felt somewhat optimistic heading to the second and easier nine. One thing that made scoring a bit difficult was the fact that the course was topdressing the greens with sand in preparation for aerating them. This made putting to the hole difficult on many greens. The course's fairways also showed the effects of all the rain and extreme heat from this summer with many bare spots. My back nine was worse than the first nine, as I double-bogeyed two easy par 3s in the first four holes. I also missed a 5-foot birdie putt at the 241-yard par 4 Twelfth Hole. After hitting my tee shot right and out-of-bounds, I made a triple-bogey 7 at the Fourteenth Hole. A bogey at the 138-yard par Fifteenth was the last gasp, as I proceeded to double-bogey the last three holes. This was especially frustrating since the Sixteenth and Seventeenth holes are par 5s where I hit perfect tee shots, but chunked easy layup and pitch shots. It added up to a back nine 50 and 97 for the round. This was two strokes higher than the 95 I shot in 2008, when I made a birdie and four pars. The most disappointing things about my round at Jonathan's Landing was I didn't take advantage of the easier holes on the back nine, I double-bogeyed every par 5 and I wasn't warned about the greens being topdressed before teeing off. I was happy, however, that I managed to shoot under 100. One interesting aspect of the course is its location. It is on the approach to Dover Air Force Base and throughout my round, Air Force transport planes continually flew literally overhead. Labor Day week means vacation time and a week at the Delaware beaches, where the Muni Golfer has plenty of family. While the week means beach time for Mrs. Muni Golfer, it is a min golf-getaway for me. The week offers me the chance to play three rounds at three different courses. Since I hadn't played for two weeks leading up to the getaway, I decided begin my golf vacation with a warmup round at the American Classic Golf Club in Lewes. A nine-hole course that plays to a par 32, you can play around twice for 18 holes. 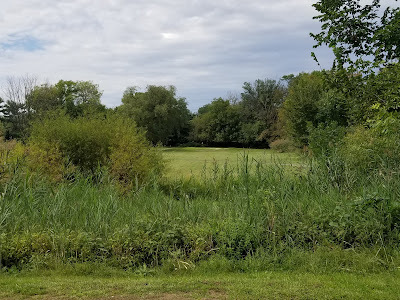 When the course was first built by the Heritage Inn, it was a nice par 35 that played to 2,359 yards and featured two par 3s, seven par 4s and a par 5 whose green was an island. But eventually, development won out and housing was built around the course, forcing holes to be shortened. Maintenance seemed to get less and less, to the point where you could play all for only $10. A couple of years ago, the course was purchased from the Heritage and it has undergone a transformation. Upgrades have been done and conditions have improved. I paid $35 to walk on the Sunday before Labor Day. My round started off with pars and the First and Second holes. I was playing well until I reached the par 4 Sixth Hole, which used to play as a long par 5, with an island green. I duffed the ball down the fairway and deposited it into the pond. I would making a 10. I splashed my tee shot at the Seventh and wound up making a triple-bogey 6. That was followed by a double-bogey at the short par 3 Eighth. I finished off the front nine with a par and a score of 46. The second nine couldn't have been any more different. I made a birdie at the last hole to go along with five pars. If I hadn't triple-bogeyed the 175-yard Fourth Hole, which used play as a 400-yard par 4, I might have broken 80. As it was I shot a 36 on the back and a score of 82. 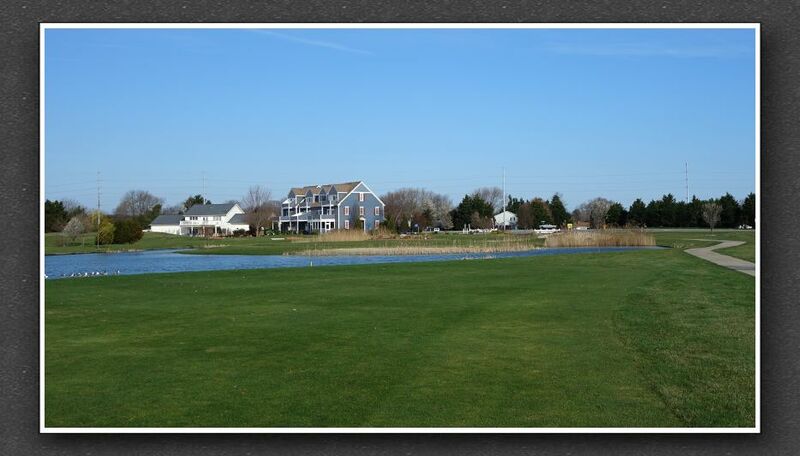 A good warmup round to begin my Delaware golf vacation.